Could This Be the Next Master of Orion? Yeah, both have its pros and cons. Here’s a secret: My plan is to kick MoO 1/2 off of its pedestal, and have BB be the new 4X TBS game to be compared to :) But in order to do this, I have to have all the best elements from both games available in BB. So this means that BB must be very moddable so if people want to “recreate” MoO 1/2, they can do so in BB. This means that I will add “options” that you turn on or off in a config file, such as single ships (MoO 2) or stacked ships (MoO 1), leaders on/off, buildings on/off, etc. However, I won’t be limited to just the best features of MoO 1/2, I plan on adding my own features. There’s already one such feature, the planet management screen where you can manage all of your planets from one spot. Neither had that, and as a result, suffered from tedious micromanagement issues (MoO 2 more so). My plan for BB is similar to Dwarf Fortress, keep on maintaining and adding new features long after release. It’s more of my hobby, something that I enjoy doing in my free time, than an attempt to capitalize on the game. However, it’s very helpful to have support from the community (balancing, finances for artwork/sounds, etc). One thing that I’ve noticed is that after the game is mostly playable, it’s easier to work on it. The hardest part was setting it all up (pathfinding, galaxy generation, turn processing, etc). This is where most projects failed, but I’m now past that point. I can now focus on the fun stuff, such as space combat. It’s easier to stay motivated now, because now I can go “Oh, what fun feature can I add?” and work on items that I want, instead of being overwhelmed with necessary features that I need to implement to make it playable. It’s kinda like when you create a FPS, the hardest part would be setting up the engine, creating a level, implementing a weapon, adding collision detection, etc. Then once you have a functioning game, you can add new monsters, new weapons, new features that’s not necessary to make the game playable, but adds fun factor. Impressively awesome, huh? He then offered to answer more questions, so I asked him a bunch, the answers to which you can read by clicking below. Enjoy! Brian: For folks who are unaware, could you please give us a description of Beyond Beyaan in your own words? 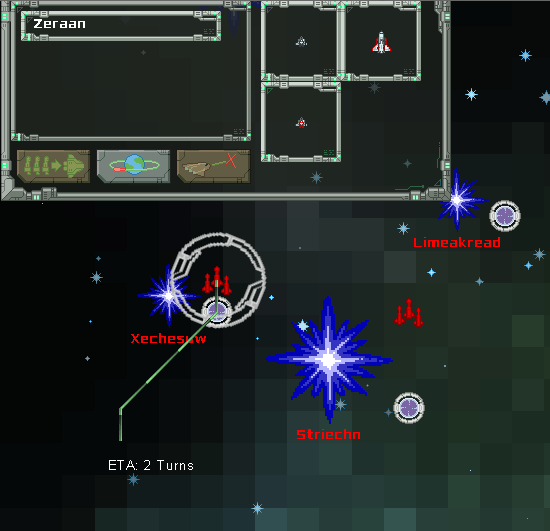 Brent: It is a 2D turn-based 4X space strategy game, similar to the classic 4X games from the 90’s. Brian: You’ve been at this for well over a year! What inspired you to create Beyond Beyaan? Brent: Over two years actually. I first started this in Dec of 2009. At that time, I just finished an asteroids clone called “Asteroids of Beyaan”, and was thinking whether or not if I have the capacity to create a 4X game, which was my childhood dream. Ever since I played Master of Orion 1 , I’ve always wanted to create my own 4X game. Master of Orion 2 came out, and I played that, but not as much as the first one. There were some other games, such as Space Empires, Pax Imperia, and Imperium Galactica that I enjoyed as well, but I keep going back to Master of Orion 1. I kept wishing that there’s a worthy sequel to Master of Orion 1 that kept its style of interface (sliders and macromanagement), but most of the new games were either too complex, too micro-intensive, real-time, or 3D. I miss the simplicity of MoO 1, so I decided that if I want a real sequel, I’ll have to create it. So that’s how I decided to start on Beyond Beyaan . Brian: How many hours would you say you’ve put into Beyond Beyaan since you began, and what has been the biggest programming challenge? Brent: Heh, I don’t know how much hours. Easily well over hundreds. As of now, there’s about 24,000 lines total in the game, not including the data/script files. The biggest challenge would be making sure that things are easily moddable. When I realize that something need to be converted to data-driven, I’d have to write the new code, then overhaul any of the code that relied on the old code to use the new code, which isn’t always easy. It’s tedious and dull, but in the end, it’s totally worth it! Each of those overhaul can take me a week to complete. There wasn’t any particular tricky challenges that I could remember, just the tedious task of adding features and working on screens. Brian: Since this game is unabashedly inspired by Master of Orion and Space Empires, what are your favorite bits from those games that you’ve incorporated into Beyond Beyaan ? Brent: I love the space combat from those games. I loved the special equipment that can do neat things, like the Black Hole Generator that can wipe out stacks of ships in MoO 1. I also liked the idea of component damage from Space Empires. Those aren’t implemented yet, but it’s in the plans. I also like the simple ground invasion from MoO 1, that’s implemented as well, however you can have more than one race on a side during a ground combat in my game. Brian: In your quote above, you mention how moddable you’d like Beyond Beyaan to be. Could you go into more details about the modding options available to the player? You can modify the technologies, their starting levels, whether or not they’re required to show up in the tech tree, and their attributes. Racial technologies are also possible. You can modify each race’s starting condition. One race can start with one planet in one system, with a scout ship. Another race could start with 10 systems, each with 2 or 3 planets owned, and a massive fleet. You can modify star types and planet types to be used in the game. They also include which sprite/shader to use for each type. So you can add silly things like “Donut Planet” if you want. You can specify what planets can spawn for different types of stars. You can add new races, complete with custom sprites and ship graphics. You can create/modify galaxy generation scripts. So you could create a smiley face galaxy if you want, or a spiral 2-armed. Creating new weapons/effects – For example, a frozen effect would render a ship blue, using a shader, and it would be applied if you hit the ship with a certain weapon. AI scripts – You will be able to modify the AI, so if you find the AI too weak, replace with an custom-made one to give yourself more of a challenge. I’ve added support for modding such that you don’t have to replace the existing files, you just simply create a new directory in the “Data”, and the game presents you with a drop-down allowing you to select which folder to load data from. Brian: Since I’ve begun tracking your game months ago, you’ve been very prolific in posting your progress. Do you find all these posts and their comments helpful in making the game? Brent: Yes, seeing people interested in my game gives me a warm fuzzy feeling. I know that people want a game similar to MoO 2, and seeing that they like where my game is going, it gives me motivation. Brian: I’ve not seen much on the blog — unless I’ve missed it — about races in Beyond Beyaan. Are there fixed races — and if so, could you describe them — or is there flexibility in creating player races like in Master of Orion 2? Brent: It’s a bit different from Master of Orion 2. In MoO 2, you can customize an existing race’s attributes, but the AI never have custom races. Nor can you add new race sprites. In Beyond Beyaan, you don’t “customize” a race in-game. Rather, you create races in the race directory, and modify their attributes there. That way, both you and the AI can use those races, and you can have your own custom artwork. There’s no checks to make sure races aren’t overpowered, so you can create imbalanced races if you want. For example, if you want to do a zombie outbreak game, you could create a zombie race that starts with 30 systems and a lot of ships, while you start with only 1 system and a few ships. And you can create a custom AI for that race to make it act more zombie-like. To do that, you pick Zombie as race, “Zombie-AI” as the AI script to use, and add that as a computer-controlled player. Then you pick “Humans” as your race, then you start the game and start having fun! So far, there’s three races, the Humans, Zero People, and Space Hamsters. I plan on having eight races for the release. Two of them will be space-based meaning that they don’t live on planets, and one will be a hybrid, meaning both space-based and planet-based. The remaining five (including the three existing races) will be planet-based. Brian: What is your favorite thing about the current build of Beyond Beyaan, and why? Brent: It is very flexible. I can easily add custom data without having to tweak the code. So if I want to add more star types, I just modify the stars.xml file. I also love the ground combat, it’s fun seeing them kill each other. Those are my current favorite features. Brian: How much detail will be available to the player in Beyond Beyaan, and will it be friendly to new players, or should one have previous experience with MoO to jump in? Brent: I plan on making it very user-friendly by providing tool-tips when hovering over elements, and a good consistent UI layout. If you’ve noticed, I’ve went to great pains making sure that everything is as simple and clear as possible. There’s still a lot to do, espeically with adding tool-tips, but the goal is that you don’t have to have experience with 4X games to play this. Brian: Finally, what makes you the most excited about working on Beyond Beyaan and why? Brent: Seeing what mods other people will create for this game. Frankly, I’m not very good at creating content, so I’m excited to see this game’s potential with modding. This is the main reason why I’m supporting mods. I, too, think MoO1 is superior to MoO2 in almost every way. So that gives him a few points in my book. You can compare your game to Dwarf Fortress after you had a (somewhat) working and continually expanding game for five years, but certainly not before you release the first public version. It's not that he shouldn't mention Dwarf Fortress as an inspiration, but for me the way he puts it sounds way too boastful. Same with removing MoO2 from the throne of 4X games. Even if you have a game that is better than it in every way it is virtually impossible to overcome the nostalgia alone that makes MoO2 great in most people's minds. Hoping to do it with an indie title just feels …delusional to me. Thirdly, the differences between MoO1 and MoO2 cannot be reduced to some options like ship stacking on/off. Certain design elements of both games have a completely different quality to them, and with most of these systems no working game can have it both ways IMO. He also says he isn't good at creating content… yet that is exactly what makes all the games he mentions so great. The content and how it interacts. Sorry if that all sounds very negative ( I considered just posting a thank you again, like with the Stardrive Q&A) but for me it sounds too much like one of those fan projects with too many, too big ambitions and a lack of sight for the things that actually make games playable. Thanks for your comment, I understand where you're coming from. I'm sorry if I sound "boastful", that wasn't my intention. About Dwarf Fortress, I was referring to their development methodology, where they focus on one game and keep on maintaining and adding features. That's very inspiring for me, and gives me hope that I can accomplish all of my goals. Instead of having all features at release, I can release a basic game, then expand on it in the future. Otherwise it'd be impossible! About removing the MoO 2 from its throne, I concur that it's impossible, similar as removing Goldeneye from N64, due to the nostalgic factor. However, it don't mean that a better 4X game can't be created, which is my goal. As for different options, it's not just "turning on/off". If an option is turned on, then the game will use certain windows/screens for that option. If off, it will use different windows/screens. For example, if stacked ships are on, it will use an window with sliders, if off, a window without sliders. I will design the UI around those options. My goal is to have the support for many different options. At my work, we have a lot of this for our products, so I'm very experienced in this kind of stuff. As for the content, I think a good analogy would be: I can create a paint program where people can create masterpieces, but I'm terrible at creating artwork. I don't mean to imply that my content will be terrible, just that it may not be as good as those that some people can create. I realize that it do sound like one of those fan projects, however I do have one thing that most of them don't. This game is still under development after two years, and have a target release date. Most of the fan projects that I've seen become abandoned after several months unfortunately. I have a clear plan on what I plan on adding to the game, and even how to add them. My only constraint is the available time I have to implement them. It's just that I actively followed many an attempt at creating an indie 4X game, crushing my hope again and again by either being abandoned or being just not a very good game. So even with you having a good schedule I'm not yet convinced of the quality as a game. I just don't see how a game can have the somewhat elaborate MoO2 battle system and stacks of ships at the same time. Directional fire/shields, component damage, boarding, and fighters are just the first few things that would need serious adaption to work with stacks. Another example: In the Q&A you mention the black hole generator, which has an almost unique interaction with the stack system (the two special systems that directly reduce total health are somewhat similar). Mind you, the stack system is actually one of the things I don't love unquestionably in MoO1. In theory the elaborate smalle-scale MoO2 combat is better, just the poor implementation and negative interaction with other MoO2 systems (industrial capacity, impact of technology, micromanagement, command points) make MoO1-stacks the lesser evil for me. So sorry again if I reacted a bit too negatively towards your confidence. I'm just a bit too jaded. Yuck, that was meant as a reply. Hope that clears it up! And again, thanks for your feedback, it helps to know what people expect to see in a game that claim to be like MoO 1/2! Not to throw a spanner into the mix, but I have played MOO 2 quite a lot and never really looked back. The tactical combat of Moo 2 is just pure awesome ,while MOO 1 had more of a Might and Magic approach which is cool, but gave each ship less meaning. Also the tech system of Moo 2 was pure awesome….. I would say MOO 1 only has nostalgia on its side, that and sliders. Compared to the MoO1 one? Do it, dude! I love this sort of thing! I also have plans on different tech system for my game. Most of it is already implemented. You can have it to be similar to MoO 1 (randomized technologies, and you pick what to research for each field), or be similar to MoO 2 (one technology per "level"). However, at release, the system will be similar to MoO 1. Later I will add support for the other systems. I'd love to listen to what actually makes Moo 1 tech tree so special? So your problem isn't with how technology are researched, but rather the technologies themselves? Such as "Improved Robotic Controls I,II,III, etc"? And missing one isn't as bad as missing one in MoO 2? Its both, making you unable to get all tech just by researching opens up a world of diplomacy , espionage etc. Moo 1 had sliders that gave you all, okay so you could research 10% here and 10% there, but honestly, there was zero point to doing so, as getting a tech fast and using it was way more beneficial than getting 10 techs at the same time but 50 rounds later. Moo 2 presents you with a choice, you cannot have it all. This is decision based, instead of just waiting until you got it all researched. I know some people like to have it all, but that's what Psilons are for. 2nd is how tech is used, sometimes they can add bonuses, sometimes they add functionality and strategy, just adding another +1 to damage like Galciv is very unimaginary.